It’s the begin of one more year, which means you’re most likely back in the workplace after vacation, working diligently on your New Year’s resolution. What’s more, in case you’re a marketer, you may also be fine-tuning your strategic plan for success in 2017. We have an assortment of assets for getting your marketing plan sorted out for the upcoming year – between the 2017 marketing strategy kit, the social media content calendar, and the blog editorial calen dar, we’ve got your content marketing strategy covered. The popularity of social media continues to rise, and 2016 was no exception. Facebook was the clear stand out social media platform and reached 1.79 billion monthly active users in the third quarter of 2016. This was followed by YouTube, which has 1.3 billion users. It is clear social media is here to stay, and businesses need to know what to do to capitalize on it and use the various platforms to their advantage. Be that as it may, before you finalize your social media strategy for the year, it’s imperative to take a look at what’s coming down the road to guarantee that you’re allotting your time and efforts appropriately. 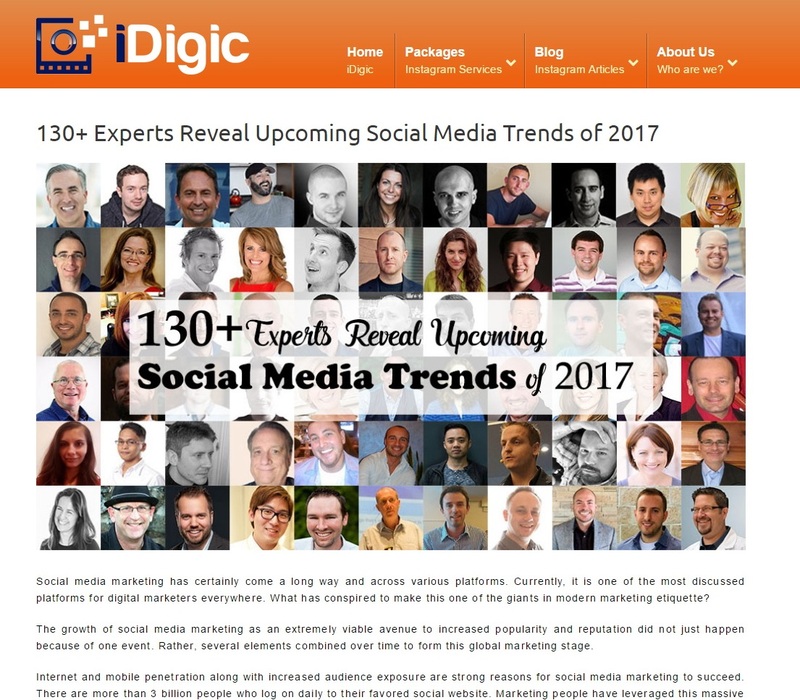 In this article that idigic.net wrote, top experts in the field are talking about upcoming social media trends, what should you expect and how to plan for these changes. Murray Newlands is also on that list and read here what he and other experts have to say about future trends in social media.